Reparto: Michael Fassbender, Brad Pitt, Benedict Cumberbatch, Paul Giamatti, Chiwetel Ejiofor, Michael K. Williams, Paul Dano, Garret Dillahunt, Quvenzhané Wallis, Sarah Paulson, Scoot McNairy, Ruth Negga, Adepero Oduye, Taran Killam, Alfre Woodard, Lupita Nyong’o. 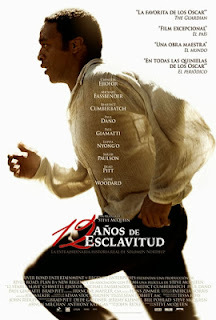 Guión: John Ridley y Steve McQueen, basado en la biografía Twelve years a slave de Solomon Northup. Producción: Dede Gardner, Anthony Katagas y Brad Pitt. Productoras: New Regency Pictures, Plan B Entertainment, River Road Entertainment y Summit Entertainment.